This is just a little teaser of my messy bed, my bedroom is undergoing a major makeover at the moment as I had mentioned before, so as of yesterday, I have sewed my curtains and a throw (pictured above) and I have my gorgeous Falucca Egyptian Cotton linen in Iced Coffee on my bed … HEAVEN!!! Absolute and total heaven! What’s next? A black chandelier, and 2 custom made lampshades… coming soon… when it’s totally transformed, I’ll be sure to post a picture. PS! 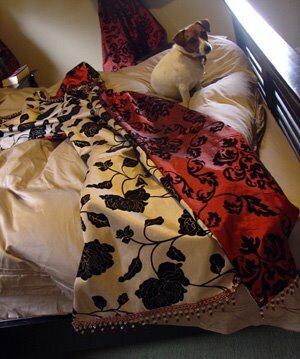 How’s this spoiled Jessie on the Egyptian Cotton linen!